Maple hardwood floors are some of the most durable and long-lasting floors. As a result they are also one of the most difficult to refinish. Before tackling this project yourself, make sure that you are confident in your abilities. Hardwood flooring is a sizable investment. When cared for properly, it can last many decades. Before you begin, determine if your floors really need to be refinished. There are a number of options short of completely refinishing the floors that can produce good results. 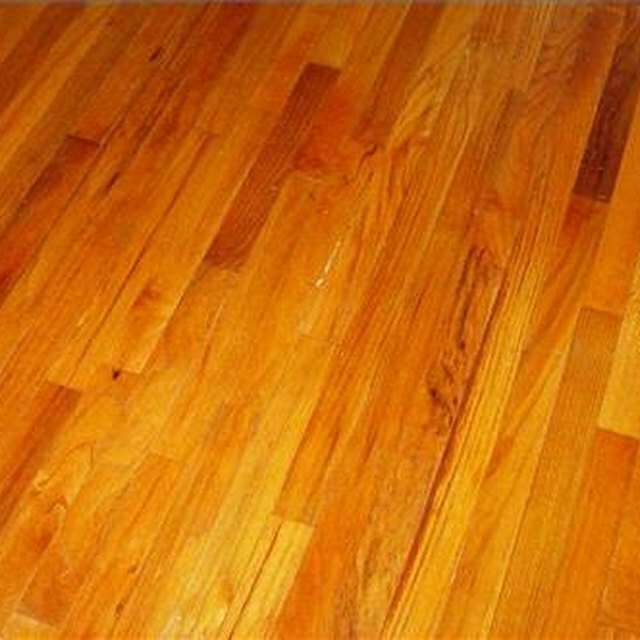 Scratches can be patched and floors can be renewed with a good cleaning and application of a wood floor polish. Fill gaps at the ends of planks and any cracks in the flooring with wood floor putty. Allow the putty to dry completely. Prep the floor by sweeping thoroughly. Use pliers to remove nails and carpet staples from the maple floors. Close the room off to avoid dust traveling throughout the house. Cover vents with plastic or newspaper. Open windows to provide ventilation. Using a drum sander (available at most rental centers) and coarse-grit sandpaper, begin sanding the floors. Go with the grain if the floors are free of bowing. Go against the grain to help correct any bowed portions of the floor. Move at a steady pace and do not allow the sander to hover in one section. Be sure to wear protective eyewear. Use a floor edger to sand the perimeter of the room. Start the floor edger while suspended and lower gently to the floor. Switch the drum sander to medium-grit sandpaper and go over the floors again. Do one more final sanding with the drum sander using fine-grit sandpaper. Use a palm sander with fine-grit sandpaper to sand the edges of the room. Use this opportunity to check for any additional cracks or nails. Repair cracks and cover nails with putty, and re-sand these areas. Completely vacuum the room to remove all sanding dust. Buff the floors with an electric buffer. Work with the grain of the wood using a fine abrasive screen.The maple flooring should develop a sheen from the buffing. Apply stain using rags. Work in from corners, wiping on stain and using a rag to remove any excess as you go. This task is usually easier with two people. One to apply the stain and one to wipe up the excess. Change rags often. Allow the stain to dry completely. Seal your maple floors using a water-based urethane sealer. Apply using a foam applicator, working with the grain of the wood. Allow the floors to dry for 24 to 48 hours before replacing furniture or allowing heavy foot traffic. Lisa East Hunter is a consultant and freelance writer in Phoenix. Her background in marketing and technology led her to explore all avenues of writing. She is currently dividing her time between freelance writing and her consulting business. Hunter has a Bachelor of Science in management information systems and marketing.